The long wait is finally over. You got Black n Yellow vs. Green n Yellow. 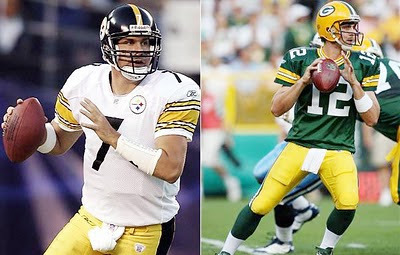 Big Ben vs. Aaron Rodgers. Two storied franchises battling it out for NFL supremacy. Pittsburgh vs. Green Bay in the comfortable confines of the Dallas Cowboys Stadium. I've been going back and forth on this game. Both of these teams are evenly matched so it's hard to pick a definitive winner. I like the Packers offense with Rodgers running the show but I also love the Steelers defense with Troy knocking out receivers. In a close game I got to favor the better defense. Rapelisberger always comes through in big games like this. I'm taking Pittsburgh with a last minute drive.